Not to be confused with the Occult. For the Shia Islamic belief, see the Occultation. For the social phenomenon, see social occultation. An occultation is an event that occurs when one object is hidden by another object that passes between it and the observer. The term is often used in astronomy, but can also refer to any situation in which an object in the foreground blocks from view (occults) an object in the background. 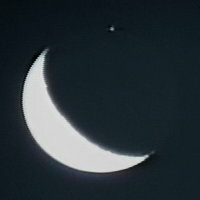 In this general sense, occultation applies to the visual scene observed from low-flying aircraft (or computer-generated imagery) when foreground objects obscure distant objects dynamically, as the scene changes over time. The term occultation is most frequently used to describe those relatively frequent occasions when the Moon passes in front of a star during the course of its orbital motion around the Earth. Since the Moon, with an angular speed with respect to the stars of 0.55 arcsec/s or 2.7 µrad/s, has a very thin atmosphere and stars have an angular diameter of at most 0.057 arcseconds or 0.28 µrad, a star that is occulted by the Moon will disappear or reappear in 0.1 seconds or less on the Moon's edge, or limb. Events that take place on the Moon's dark limb are of particular interest to observers, because the lack of glare allows these occultations to more easily be observed and timed. The Moon's orbit is inclined to the ecliptic (see orbit of the Moon), and any stars with an ecliptic latitude of less than about 6.5 degrees may be occulted by it. There are three first magnitude stars that are sufficiently close to the ecliptic that they may be occulted by the Moon and by planets – Regulus, Spica and Antares. Occultations of Aldebaran are presently only possible by the Moon, because the planets pass Aldebaran to the north. Neither planetary nor lunar occultations of Pollux are currently possible. However, in the far future, occultations of Pollux will be possible, as they were in the far past. Some deep-sky objects, such as the Pleiades, can also be occulted by the Moon. Within a few kilometres of the edge of an occultation's predicted path, referred to as its northern or southern limit, an observer may see the star intermittently disappearing and reappearing as the irregular limb of the Moon moves past the star, creating what is known as a grazing lunar occultation. From an observational and scientific standpoint, these "grazes" are the most dynamic and interesting of lunar occultations. The accurate timing of lunar occultations is performed regularly by (primarily amateur) astronomers. Lunar occultations timed to an accuracy of a few tenths of a second have various scientific uses, particularly in refining our knowledge of lunar topography. Photoelectric analysis of lunar occultations have also discovered some stars to be very close visual or spectroscopic binaries. Some angular diameters of stars have been measured by timing of lunar occultations, which is useful for determining effective temperatures of those stars. Early radio astronomers found occultations of radio sources by the Moon valuable for determining their exact positions, because the long wavelength of radio waves limited the resolution available through direct observation. This was crucial for the unambiguous identification of the radio source 3C 273 with the optical quasar and its jet, and a fundamental prerequisite for Maarten Schmidt's discovery of the cosmological nature of quasars. 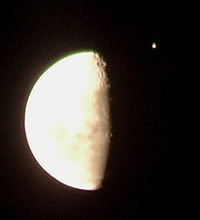 Several times during the year, someone on Earth can usually observe the Moon occulting a planet. Since planets, unlike stars, have significant angular sizes, lunar occultations of planets will create a narrow zone on Earth from which a partial occultation of the planet will occur. An observer located within that narrow zone could observe the planet's disk partly blocked by the slowly moving moon. The same mechanic can be seen with the Sun, where observers on Earth will view it as a solar eclipse. Therefore, a total solar eclipse is effectively the same event as the Moon occulting the Sun. Stars may also be occulted by planets. Occultations of bright stars are rare. In 1959, Venus occulted Regulus, and the next occultation of a bright star (also Regulus by Venus) will be in 2044. Uranus's rings were first discovered when that planet occulted a star in 1977. On 3 July 1989, Saturn passed in front of the 5th magnitude star 28 Sagittarii. Pluto occulted stars in 1988, 2002, and 2006, allowing its tenuous atmosphere to be studied via atmospheric limb sounding. In rare cases, one planet can pass in front of another. If the nearer planet appears larger than the more distant one, the event is called a mutual planetary occultation. An occultation occurs when a minor planet (an asteroid or distant object) passes in front of a star (occults a star), temporarily blocking its light (as seen from Earth). These occultations are useful for measuring the size and position of minor planets much more precisely than can be done by any other means. A cross-sectional profile of the shape of an asteroid can even be determined if a number of observers at different, nearby, locations observe the occultation. Occultations have also been used to estimate the diameter of trans-Neptunian objects such as 2002 TX300, Ixion, and Varuna. In addition, mutual occultation and eclipsing events can occur between a minor planet and its satellite. A large number of these minor-planet moons have been discovered analyzing the photometric light curves of rotating minor planets and detecting a second, superimposed brightness variation, from which an orbital period for the satellite (secondary), and a secondary-to-primary diameter-ratio (for the binary system) can often be derived. On 29 May 1983, 2 Pallas occulted the naked-eye bright spectroscopic binary star 1 Vulpeculae along a track across the southern United States, northern Mexico, and north parts of the Caribbean. Observations from 130 different locations defined the shape of about two-thirds of the asteroid, and detected the secondary companion of the bright binary star; these observations, ganged together with those of a separate occultation by Pallas in 1979, provided a complete figure for the asteroid eight years before any asteroid was visited by a spacecraft (the much smaller Gaspra by Galileo in October 1991). On 12 March 2009 there were 8 asteroid occulations, including 85 Io, 247 Eukrate, 1585 Union, 201 Penelope, 70 Panopaea, 980 Anacostia, 2448 Sholokhov, 1746 Brouwer, and 191 Kolga. Any one of these would be expected to occult at a time and place on the globe, at a certain magnitude, and with a certain star. According to the 1998 European Asteroidal Occultation Results from Euraster, 39 Laetitia was observed by over 38 observatories in one occultation on 3 March 1998, which resulted in many chords being determined. The star Regulus was occulted by the asteroid 163 Erigone in the early morning of 20 March 2014. This was the brightest occultation of an asteroid ever predicted to occur over a populated area. As the main belt asteroid passed in front of the star its 67-mile-wide (100 km) shadow swept across Nassau and Suffolk counties, all of New York City and the Hudson River Valley, with the center of the shadow path following a line roughly connecting New York City, White Plains, Newburgh, Oneonta, Rome and Pulaski before crossing into Canada near Belleville and North Bay, Ontario. Bad weather obscured the occultation. This animation shows the path of the shadow of the dwarf planet Makemake during an occultation of a faint star in April 2011. Note: the actual shape of the shadow on Earth will not be exactly round as shown here. This video is to illustrate the phenomenon. Preliminary results of a 6 November 2010 occultation by the dwarf planet Eris of a magnitude 17 star in the constellation of Cetus placed an upper limit on Eris's diameter of 2320 km, making it almost the same size as Pluto. Due to their slower movement through the night sky, occultations by TNOs are far less common than by asteroids in the main-belt. The dwarf planet Haumea was observed in a stellar transit on 21 January 2017, identifying a ring. The Moon or another celestial body can occult multiple celestial bodies at the same time. Because of its relatively large angular diameter, the Moon at any given time occults an indeterminate number of stars. However, an event when the Moon occults two bright objects (e.g. two planets or a bright star and a planet) simultaneously is extremely rare and can be seen only from a small part of the world. 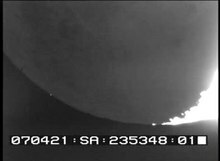 The last event of such type was on 23 April 1998 when the Moon occulted Venus and Jupiter for observers on Ascension Island. The Big Occulting Steerable Satellite (BOSS) was a proposed satellite that would work in conjunction with a telescope to detect planets around distant stars. The satellite consists of a large, very lightweight sheet, and a set of maneuvering thrusters and navigation systems. It would maneuver to a position along the line of sight between the telescope and a nearby star. The satellite would thereby block the radiation from the star, permitting the orbiting planets to be observed. The proposed satellite would have a dimension of 70 by 70 metres (230 ft × 230 ft), a mass of about 600 kg, and maneuver by means of an ion drive engine in combination with using the sheet as a light sail. Positioned at a distance of 100,000 km from the telescope, it would block more than 99.998% of the starlight. There are two possible configurations of this satellite. The first would work with a space telescope, most likely positioned near the Earth's L2 Lagrangian point. The second would place the satellite in a highly elliptical orbit about the Earth, and work in conjunction with a ground telescope. At the apogee of the orbit, the satellite would remain relatively stationary with respect to the ground, allowing longer exposure times. An updated version of this design is called the Starshade, which uses a sunflower-shaped coronagraph disc. A comparable proposal was also made for a satellite to occult bright X-ray sources, called an X-ray Occulting Steerable Satellite or XOSS. ^ a b "Occultations of bright stars by planets between 0 and 4000". Retrieved 2005-06-16. ^ Hazard, C.; Mackey, M. B.; Shimmins, A. J. (1963). "Investigation of the Radio Source 3C273 by the method of Lunar Occultations". Nature. 197 (4872): 1037. Bibcode:1963Natur.197.1037H. doi:10.1038/1971037a0. ^ See this site for information. ^ "Stellar Occultations". MIT Planetary Astronomy Lab. 2007-12-20. Retrieved 2009-10-26. ^ Dunham, David W.; (45 more authors) (1990). "The size and shape of (2) Pallas from the 1983 occultation of 1 Vulpecuale". Astronomical Journal. 99 (5): 1636. Bibcode:1990AJ.....99.1636D. doi:10.1086/115446. ^ Preston, Steve. "Asteroid Occultation Updates". Retrieved 2009-02-25. ^ a b Dunham, David (2006). "The International Occultation Timing Association 24th Annual Meeting at Mt. Cuba Observatory, Greenville, Delaware". International Occultation Timing Association. Archived from the original on 18 July 2011. Retrieved 13 February 2011. ^ Vitagliano, Aldo (2010). "The Solex Page". Università degli Studi di Napoli Federico II. Archived from the original on 18 September 2015. Retrieved 13 February 2011. ^ "Volunteer observers invited to time the March 20, 2014 Occultation of Regulus". ^ Brown, Mike (2010). "The shadowy hand of Eris". Mike Brown's Planets. Retrieved 2010-11-07. ^ Ortiz, J.L. ; (91 more authors) (2017-10-12). "The size, shape, density and ring of the dwarf planet Haumea from a stellar occultation". Nature. 550 (7675): 219. Bibcode:2017Natur.550..219O. doi:10.1038/nature24051. ^ "New Mysteries Surround New Horizons' Next Flyby Target: NASA's New Horizons spacecraft doesn't zoom past its next science target until New Year's Day 2019, but the Kuiper Belt object, known as 2014 MU69, is already revealing surprises". NASA. 2017-07-05. ^ "NASA's New Horizons Team Strikes Gold in Argentina". New Horizons: NASA's Mission to Pluto. 2017-07-19. ^ Copi, C. J.; Starkman, G. D. (2000). "The Big Occulting Steerable Satellite (BOSS)". The Astrophysical Journal. 532 (1): 581–592. arXiv:astro-ph/9904413. Bibcode:2000ApJ...532..581C. doi:10.1086/308525. ^ "The X-ray Occulting Steerable Satellite (XOSS)". CASE. Retrieved 2007-02-09. Meeus, Jean (1995). Astronomical Tables of the Sun, Moon and Planets. Richmond, Virginia: Willmann-Bell, Inc. ISBN 0-943396-45-X. (in German) Marco Peuschel – Astronomische Tabellen für den Mond von 2007 bis 2016, Mondphasen, Apsiden, Knotendurchgänge, Maximale und minimale Deklinationswerte und Sternbedeckungen sowie ausführliche Ephemeriden für jeden Tag des Jahres, inkl. Mondauf-und Untergänge und physische Daten.